Hotel Zanzibar was a civilian hotel in Old Mombasa on Earth. In October 2552, during the Battle of Earth, the Hotel Zanzibar was abandoned, along with the rest of the city. When the UNSC In Amber Clad dispatched Pelicans full of relief troops for the massive battle going on inside the city, one of those Pelicans was shot down by a Scarab near the hotel. The Marines who survived the crash set up a command post inside the hotel lobby. They were surrounded and almost overwhelmed by Covenant ground forces when SPARTAN-117 arrived and aided the surviving Marines, eventually leading them into New Mombasa. The hotel bears a slight resemblance to the Guggenheim Museum in New York City, New York. 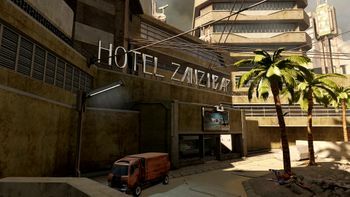 Hotel Zanzibar, as it appeared in Halo 2. Hotel Zanzibar in Halo 2: Anniversary. Hotel Zanzibar billboard in Halo 2: Anniversary. Zanzibar and Grille billboard in Halo 2: Anniversary. Note the Superintendent flag.